“Like the sands through the hour glass, so are the days of our lives.” Thus began the brand new soap opera, Days Of Our Lives, which made its debut on November 8th, and has been on the air ever since. At 5:16 p.m. the following day, most of the northeastern Unites States was plunged into darkness during the “Great Blackout of 1965”. Power was lost for most of New England, portions of New York, Long Island, New Jersey, and nearby Canada. The outage lasted about thirteen-and-a-half hours, and was due to human error. As I recall, I was having dinner in our kitchen, and at first thought my younger brother had turned off the lights. On November 15th, race car driver Craig Breedlove set a new land speed record of 600.601 mph, breaking his own record which he’d set only a few days before of 555.483 mph. For those scoring at home, a car moving at 60 mph is traveling 87 feet-per-second. A car moving 600 mph is traveling 879 feet – in one second! And in case you’re wondering, the current record stands at 763.035 mph. Closer to home: a house on Tunmore Road in Greenville fell victim to arson shortly after the death of its owner. It was believed the fire was deliberate because nearby fire hydrants had been opened prior to the arrival of firefighters which lowered water pressure and hindered firefighting efforts. The drought of the summer and autumn of ‘65 set the stage for dry conditions, making the November woods a tinderbox awaiting a spark. When that spark came, local firemen were kept busy fighting a massive brush fire between Douglas Pike, Limerock Road, and North Central Airport. The fire destroyed at least one home in its path. Meanwhile, 2nd Lieutenant James F. Panzarelli of Fenwood Avenue in Esmond was promoted to 1st lieutenant. Thanks to both men for their service to our country. Burgess Field in Greenville, a.k.a. 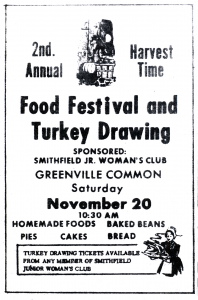 “The Apple Bowl” was the scene of a Thanksgiving Day football game between the Smithfield Raiders, (Not the Sentinels?) and the Johnston Panthers. Accordion musicians from around the country participated in a competition held at the Statler Hilton Hotel in New York City on November 19th and 20. John Jenkins of Smithfield was one of those who won an award. 1964 Rambler convertible. Radio and heater. Very clean. Must sell. Best offer. Yes, before the days of under-the-dash 8-track stereos, cassette players, CD players, and satellite radio, if one wanted to sell a car, it helped if it had a simple AM radio. And if one lived in Florida, they might have saved a few bucks by forgoing the optional heater. Another ad listed a 1958 Chevy Belair for $200.00. According to an Internet search, the average price for a fully restored ’58 Belair today is $35,000. A meeting was held at the Greenville Fire Station to name a committee to head the Toys For Needy Children Drive for the upcoming Christmas Season. This was an annual event at the time, where fire department members would collect and distribute toys to local underprivileged children. Those appointed to the committee included, Russell Keach, Raymond White, Elmer Suitor, Robert Carroll, and Albert Rathier.